Background: Currently, spectrum sharing policies specify inflexible spectrum access controls such as exclusion zones and maximum transmit powers based upon statistical characterizations of all potential operating environments. The rules for preventing interference are influenced by low probability events and are set at conservative operating levels. Consequently, spectrum sharing potential in the majority of operating conditions is limited by a small percentage of relatively rare conditions, which results in inefficient spectrum usage. Objective: This paper adopts a probabilistic view of dynamic spectrum sharing systems. Specifically, establishing in situ probabilistic reasoning reasoning within the context of a specific spectrum access environment enables sharing systems to adapt to local conditions and uncertainties. Regulators and spectrum users can establish spectrum access rules defining acceptable levels spectrum access risks. Method: The paper develops a probabilistic reasoning model using Bayesian Networks to encode the phenomenology of the communications channels and systems, and also represent the cause--‐and--‐ effect nature of dynamic spectrum sharing. This approach allows systems to infer permitted actions (e.g., maximum transmit power) based on incomplete knowledge and established interference risk thresholds. Results: Simulation results demonstrate that situation--‐specific probabilistic reasoning combined with risk--‐constrained spectrum access potentially enables greater spectrum sharing potential. Sharing systems can increase transmit powers for greater channel capacity or increase network density over existing spectrum sharing approaches. Situational uncertainty can also be reduced as sharing systems observe the operating environment, leading to further performance gains. 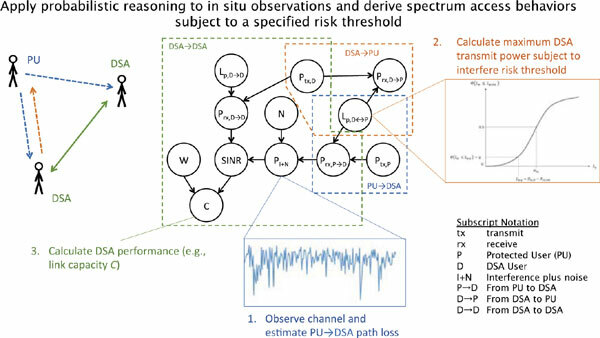 Conclusions: The results of this paper demonstrate significant potential for probabilistic reasoning and risk constrained spectrum sharing for increasing spectrum access. Dynamic spectrum access, cognitive radio, probabilistic reasoning, risk-constrained, decision making, commercial broadband.